"How to Cheat in Maya" focuses on the art of animation and how it is done in Maya. The book presents productivity tips and tools so that animators can get things done in the most efficient way possible - and obtain quality results with a minimum effort. The other anchor for the book will is that it discusses universal techniques within the art of animation - but for Maya. Readers will learn which circumstances call for which techniques, and and how to get quality results fast. Topics like: What do things like anticipation and settle look like in the graph editor? How are moving holds done effectively from a technical standpoint? Which tangent types are useful for which situations? 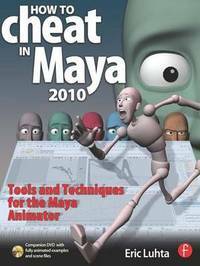 These nuggests of information make "How to Cheat in Maya" an invaluable resource for artists and animators. The DVD includes all Maya files, as well as video files of the animations demonstrated in the book. An accompanying web site will also be part of the package. -- Format of instruction lets animators apply techniques and concepts to their personal work and vision. -- Scene files included so that readers can see "under the hood" of a professional animator's work. -- Efficient, creative presentation lets readers quickly understand how to apply a technique to a multitude of uses. -- Character animation focus fills an overlooked niche. -- Video files with demonstrations for animators to follow along frame by frame. Eric Luhta is a professional animator whose recent credits include "Bioshock 2", "Cloudy With A Chance of Meatballs", "Horton Hears A Who! ", and numerous television commercials. Eric has extensive experience with Autodesk's Maya, including teaching it, as an instructor for the Maya Training Program at AnimationMentor.com. He currently lives in Los Angeles, CA with his wife and 3 computers.